Did you know that math can become art? It's true! 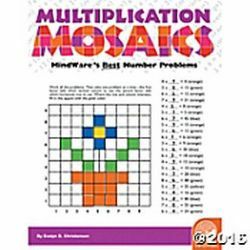 In Multiplication Mosaics, students will solve mathematical equations, plot the answers onto the grid and then color-match the numbers into fun patterns and images. This book is a great way to incorporate a fun and creative visual element into what is sometimes viewed as an arduous task for students: memorizing multiplication tables. The simple yet delightful images that emerge from these basic equations will open the door to learning math at higher levels. As students solve the equations and color squares to complete the pictures, they are able to directly see the results of their work, making these puzzles perfect for students who enjoy visual challenges and direct feedback. This book includes 30 single-page mini-mysteries plus illustrated solutions. Softcover; 48 pages. Reproducible for single-classroom use.